Combine tuna, celery, onions, pickle relish, dry mustard, mayonnaise and chopped eggs. Mix lightly until well blended. Layout bread bowls on a sheet pan. 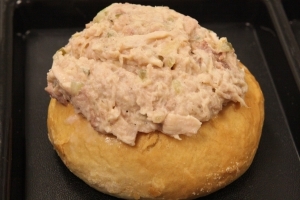 Using a #8 scoop, place a 1/2 cup portion of tuna salad in the bread bowl. Portion one bread bowl stuffed with ½ cup tuna salad per serving. Each portion provides 2 oz. eq. meat/meat alternate and 2 oz. eq. whole grains. If changes are made in ingredients, check crediting information and re-calculate the nutrition analysis. "Culinary Techniques for Healthy School Meals” provides seasoning and serving ideas for sandwiches. 1 serving of Tuna Salad in a Bread Bowl.